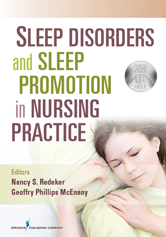 This book is unique in that it examines sleep and sleep disorders from a nursing perspective...It is a valuable resource for academic nursing, as well as a relevant and useful companion for clinical nursing professionals. Score: 94, 4 Stars.--Doody's This comprehensive volume presents the latest scientific evidence on health promotion, prevention, and treatment for sleep and sleep disorders. This graduate textbook and reference guide provides strategies for promoting normal sleep, caring for disordered sleep, and supporting sleep in health care settings. Written by leading nursing experts, this book is an invaluable source for graduate educators and students, as well as practitioners and researchers caring for patients suffering from sleep disorders.